Pure and simple, I look for apps that save me time (efficiency), increase my professionalism (administration) and link technology with clinical skills (resources). Here you will find my 5 current favourite apps, that meet the above criteria in various ways. Being a modern practitioner means having skills in many different areas and making use of technology is one of those. Along with the report, you'll receive a complimentary subscription to a weekly email series of 9 Clinical Gems directly to your inbox, ideas, information, insight and inspiration on a regular basis, helping you unravel those clinical conundrums appearing every day. YES, I would like to join over 5500 health professionals & receive your regular newsletter updates sent to my email inbox. Success! Now check your inbox for your free report. 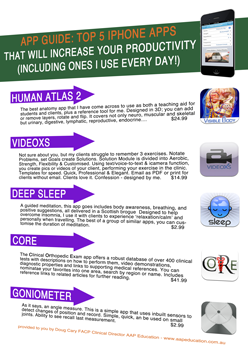 I believe you will also benefit from these apps. If you want to rave about an app you use on a regular basis, please leave a comment on my app blog.